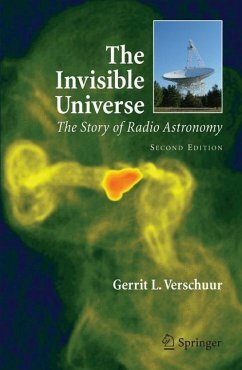 This is the story of radio astronomy, of how radio waves are generated by stars, supernova, quasars, colliding galaxies, and by the very beginnings of the universe itself. This revised book provides an update on the state of radio astronomy and those sections no longer regarded as cutting edge have been removed. With this book, aimed at a lay audience, you learn what astronomers are doing with those huge dishes. With each of these observatories, the scientists collect and analyze their data, "listening" to the radio signals from space, in order to learn what is out there, and perhaps even if someone else may be listening as well. Author of seven books, co-author or editor of 3 text books in radio astronomy and astronomy in general, has written over 80 scientific research articles, and 90 + popular astronomy articles. He lectures widely on astronomical topics, pioneered the study of the interstellar magnetic field and active in radio astronomical studies of interstellar matter for over 40 years. Published the first ever, full-length, technical paper on the radio search for extraterrestrial intelligence in 1973. Has taught in the physics departments of some half-a-dozen universities, world-wide. He is the holder of a dozen patents. Introduction: Adventure, Imagination, and Curiosity.- What is Radio Astronomy?.- A Science is Born.- The Radio Sun and Planets.- The Galactic Radio Nebulae.- Radio Waves from the Milky Way.- Interstellar Hydrogen.- Interstellar Molecules.- Pulsars.- The Galactic Superstars.- Radio Galaxies.- Quasars.- The Grand Unification: Active Galactic Nuclei.- Beyond the Quasars-Radio Cosmology.- On the Radio Astronomical Quest for Extraterrestrial Intelligence.- Radio Telescopes: The Future.- What's it All About?.